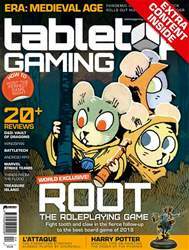 A FREE GAME FOR YOU TO PLAY IN SIDE EVERY ISSUE OF TABLETOP GAMING! You are a proud child of Charolus-By-Sea, a small fishing village on a ragged coast. Equally at home in the water as on land, you’re a Wreckdiver, like your parents and their parents before them. Every day, you and your friends paddle your boat into the waters, and dive into the countless shipwrecks beneath the waves, salvaging treasure. There’s riches to be had, but also great danger!